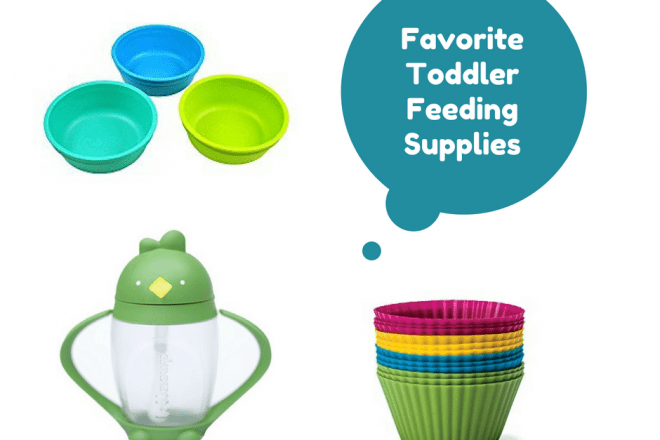 Make mealtime easy for you AND your toddler with these top toddler feeding supplies. I never knew a truly messy kitchen until I had a toddler. I think my absolute least favorite food to serve (which of course, my son loves) is shredded cheese. It ends up EVERYWHERE. I have tried a lot of different products over the past year to find feeding supplies that work the best. This way my son gets more food in his mouth and less on the floor, making both of us happier! The Lollacup is my favorite all-around cup. It works for water, milk, smoothies, and anything else your toddler might be drinking. The only downside is you have to hand wash it. BUT it comes with a straw brush, and all of the pieces come apart so there is nowhere for yucky bacteria to build up. You can really get these totally clean. The Munchkin 360 Sippy is my favorite for water. Kids learn how to drink from a regular cup with these since there is no straw or spout. Best part is that they do not spill easily. They splatter a bit when thrown on the floor, but I’ve never had a lid come off or any big spills. Plus, they fit right into the carseat cupholder. Also very easy to clean. The Camelbak bottle is typically what I send with my son to daycare. It’s a great size. I only use water in these. And again, they are easy to clean. I love the Munchkin brand cups. I like that toddler hands can fit in and out easily, with minimal mess! Re-Play is my favorite brand. Not only are the dishes sturdy, they are the perfect size for toddlers, and BPA-free. We use the divided plates for most meals. The sections are deep enough that you can even serve things like oatmeal or stew in them. I have tried SO MANY types of silverware. I prefer different spoons for babies, but I’ve found these simple Gerber Graduates forks and spoons to work best for us. The shape and size allow my son to get a good amount on the fork or spoon, and get the food into his mouth without spilling it all down his shirt. These popsicle molds are awesome! I usually just fill them with leftover smoothie and pop them in the freezer for a snack later. My son can hold onto these easily, and I know what you’re thinking – but popsicles really are not that messy with these. I don’t know if I’d bake as much as I do if I didn’t have these silicone cups! Nothing sticks to them. We’ve made tons of different muffins, baked oatmeal cups, mini frittatas, and more. There are tons of cookie cutters out there, so find shapes that you think your toddler would love! We have these as well as a set of dinosaur shapes. I am partial to these because they are fairly small, and great for making shapes that are bite-size. Love these cups when we’re on the go. On busy mornings I’ll pour my son’s smoothie in one of these cups, because the last thing I want to do when we get home at the end of the day is clean a dried, caked-on smoothie out of one of our reusable cups. I also like to bring these to outdoor playdates where I think I might lose track of things, since I won’t be disappointed to lose one of these. I also have a fancy blender (a Vitamix), but I just LOVE having the Magic Bullet on my counter. It does a great job blending up smoothies, does not take up much counter space, and prevents me from lugging out my giant Vitamix in the mornings when I just want to make a quick smoothie. Plus you can just throw the cup in the dishwasher when you’re done. Do I need to explain that toddlers make a mess? I keep this Honest multi-surface cleaner on hand to quickly wipe down the table before and after we eat. I like that it’s non-toxic with no harsh chemicals, so I feel good about my son eating food directly off the table when he knocks things off his plate. Last but not least, a learning tower! We bought one off Craigslist from a local grandpa who started making them for his grandkids and then realized that other people would like them too. So, I don’t have this particular model. But the learning tower is probably the most-used item in our kitchen. I think my son started in it around 18 months? I was so tired of him whining at my feet while I was working in the kitchen. In his tower, he’s in a safe place where he can “help” me or just be next to me while I’m preparing food. Disclaimer: Please note this post is not sponsored, and instead is a list of our favorite things. It does contain affiliate links via Amazon. Thank you for the support and few cents that come from clicking on the links!